Last Tuesday morning, I spotted something out of place on the sidewalk near the door of my building. At first glance it looked like a piece of trash, but it was moving, slowly. It was a turtle! I looked at other passersby to see if they too had witnessed this uncommon sight. One woman stopped in her tracks, surprised, but she was on her way to the bus and kept walking. The dog walker with five four-legged companions already had enough on his hands. It seemed like the turtle’s fate would be up to me. I had worked as a nature educator in Harriman State Park, so I knew enough to tell that the turtle was female. And she was either a box turtle or a wood turtle, not a household pet. I knew she wouldn’t last long on my busy Brooklyn block. It would be nice to think that this turtle was a sign that the city was getting green enough that wild turtles were migrating here to live in their natural habitat, but this is not the case. I picked up the turtle and brought her indoors. I confirmed that she was indeed a wood turtle, based on the pattern on her underbelly, called a plastron. Wood turtles are a species of special concern in New York State, meaning their population is considered at risk of becoming endangered. Instead of releasing this turtle in Prospect Park, I decided to investigate other options and called the Department of Environmental Conservation (DEC) at the suggestion of a friend. 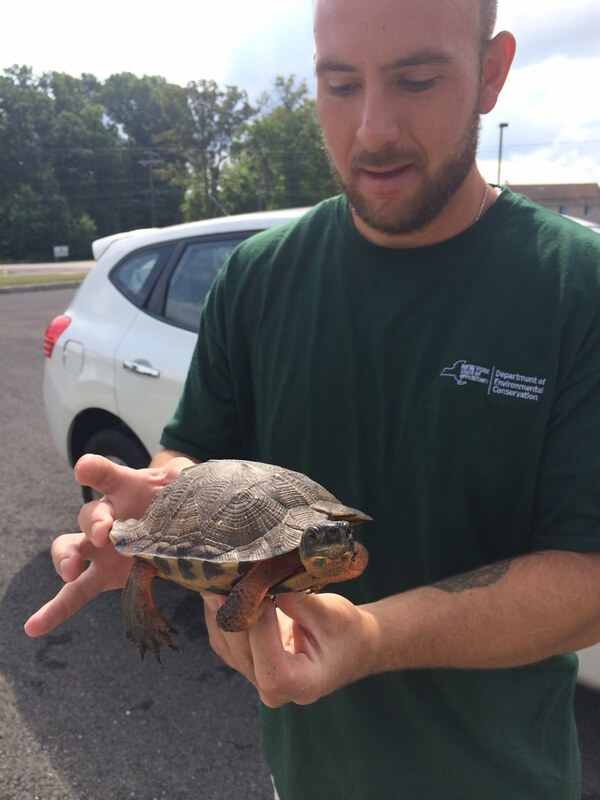 Dan, the DEC Region 3 wildlife technician I spoke with, was surprised to hear that a wood turtle had been found roaming the streets of Brooklyn. This was far from the rocky bottom brooks and woodlands that make up their natural habitat, he said, and she had most likely been taken from her home by people. We made a plan for me to transport her to the DEC Region 3 office that Friday. When Dan saw Brooky (the name we at BBG gave her), he was able to confirm that she was a wild turtle based on her missing claw and stubbed tail. It was a shame she was taken out of her natural habitat, he said. As a seemingly healthy mature female, she is an asset to her species and its survival. Once turtles are removed from their habitat and housed in captivity, they sometimes cannot be reintroduced into the wild due to their potential for carrying diseases. Thankfully, this healthy turtle was able to be relocated to Teatown Lake Reservation in the Lower Hudson Valley. She will be tagged and monitored so that wildlife researchers can learn more about this species and ensure that she is adapting well to her new home. Erin Baker, animal care supervisor at Teatown, said it was good that I followed proper protocol in rescuing this turtle. Turtles can sometimes travel up to 50 miles to try and find their home, so releasing them in urban environments is not a good idea. Tampering with wild turtles is a major concern and contributes to their decline in the wild. Rescuing Brooky reminded me that every species is valuable and that it is important not to remove wildlife from natural areas. Perhaps one day the Greenest Block in Brooklyn will help usher in a world in which wildlife can safely roam Brooklyn blocks. For now, if you spot a box turtle or wood turtle on the street, you should contact a wildlife specialist or the DEC. This story does have a happy ending: Brooky has a new home at Teatown, a nature reserve that actually started out as Brooklyn Botanic Garden’s upstate outreach station. So in a way, BBG has provided this turtle a new home when Brooklyn blocks could not suffice. Finding her also reminded me that it's worth taking a moment to observe your surroundings as you walk your block, because you never know what you’ll find! Michelle Gluck Michelle Gluck is a graduate student working with BBG to evaluate the Greenest Block in Brooklyn contest. I have never seen a wood turtle. I had a similar experience with a box turtle years ago. I found one in a weedy lot in Astoria, Queens, almost certainly removed from the wild. Many don’t know they can dig out of enclosures. I returned the turtle to the wild in a woods where I knew others of his species lived. Of course, I was younger and didn’t know of the potential problems of doing so. Such turtles are highly territorial and will attempt to return to their home ranges. How fortuitous that this turtle was found by someone with turtle experience, who took the time to do some research! Please update us on how Brooky is adapting to her new home. After this wood turtle (Glyptemys insculpta) was found in Brooklyn, staff from New York State Department of Environmental Conservation helped find her a new home. Photo by Michelle Gluck.